Home » Interesting Discussions » One good tip to contain clutter and find things more easily – have a landing strip at home! One good tip to contain clutter and find things more easily – have a landing strip at home! If you can believe it, I started writing this post about creating a “landing strip for your home” about 3 years ago, almost to the day! LOL But as with the hundreds of drafts I currently have in my folder, I didn’t finish it for various reasons. What is a “Landing Strip” for your home? It is your first port of call to deposit your things as you enter your home. Think of it as a space where you stop by to place your keys, shoes, coat and bags as you enter your home. The idea is simple. Instead of tossing your things willy nilly in different parts of your home and then wasting time trying to find them before you leave the house, you corral your things in one place, so it’s easier to find, and it’s less messy. 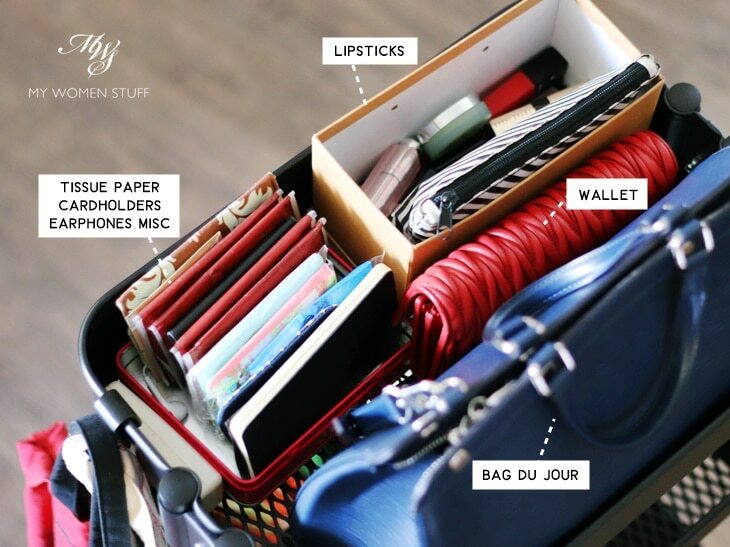 I used to come home each day and toss my bag, my shopping, and my mail on my dining table. Then, because I am a bit of a clutterbug, as I’ve self-confessed, I tend to leave them there till I can’t bear it anymore, then I declutter. Time was that I’d have no space at all on my dining table to use it for its intended purpose. Every usable surface would just be covered with paper bags, handbags and bits of mail and paper. I wasn’t proud of that! Other times, I can’t find a document I need, or my wallet, because I can’t remember where I left it last. So, the idea behind a “landing strip” for your home is quite simple. 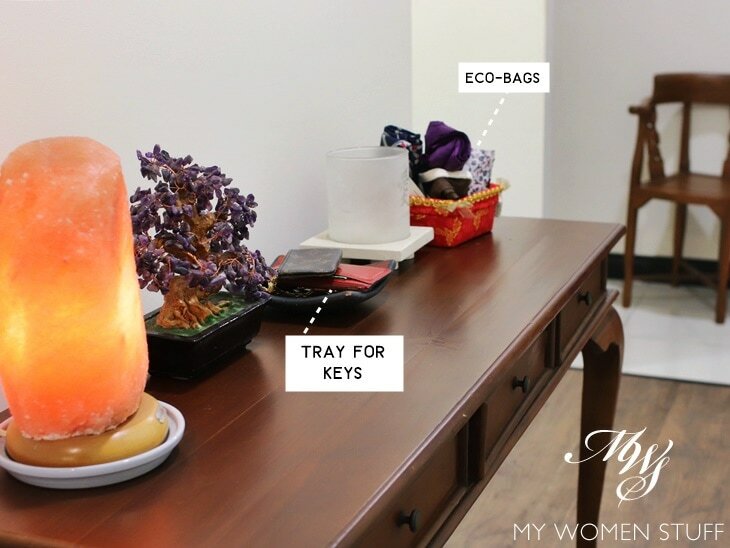 This is a place where you can quickly and easily drop your things as you enter your home. This not only allows you to be able to find them easily should you need it e.g. keys, but it also allows you to control your clutter and prevent it from spreading. This way, I always know where my keys are, where my bag is, and where my mail (read: Bills) is, should I need them in a hurry. How do you set up a landing strip in your home? First, I suggest that you step out of your house, with your handbag and whatever else that you usually carry when you exit your home. Then, step back in, and consciously see what you usually do first, and where you usually put your things. For me, I have 2 separate landing strips. The first is in the hallway, near the front door. I have a narrow side table and that is where I drop my house and car keys and take off my shoes when I enter my house (I’m Asian – we never EVER wear shoes at home unless it’s home slippers). There is also a little tray with some eco-bags so I can grab one easily on my way out the door in case I forget to pack one. The second is my primary landing strip. This is where I put my handbag, my mail and any other bits and bobs that I might pick up on the way in. Does your landing strip have to be by your front door? Most people recommend that you put your landing strip by your front door. This is logical, as you can drop them off and pick them up as you enter and exit. But I think it is more important to consider the layout of your house or apartment, and what it is that you are comfortable with. For me, I prefer not to keep my handbag by the front door. So my bags and other things are placed further inside my living area. 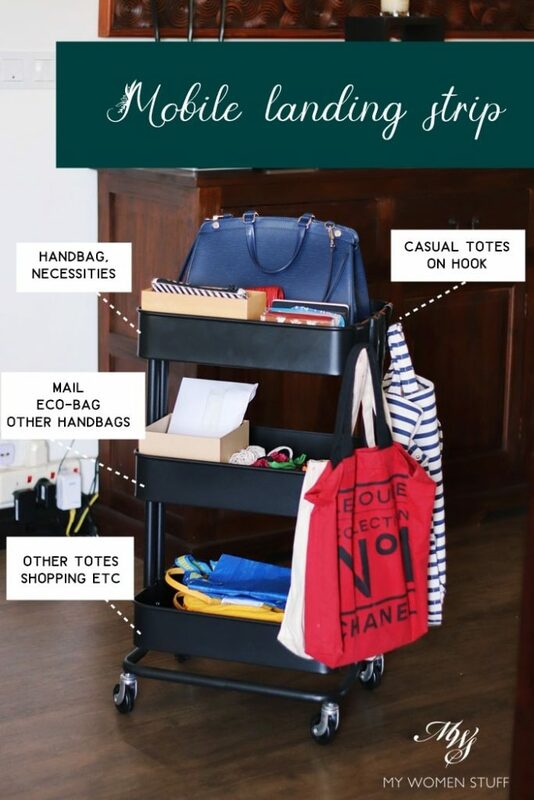 If you have a wide area by your front door, and don’t mind putting your things there, then you can do so. For things like keys and shoes however, I do find that it makes sense to place them nearer the door, because they are usually the last things you’d pick up on your way out. It is also more likely that you drop them off first, as you enter your house. We don’t wear coats or boots here in Malaysia, but it makes the most sense to have your coat rack or coat hooks near your front door, as that’s where you’d take off and put on your coats and boots as you enter and exit your home. Some people take their bags off and place them there, because they don’t need it anymore till they next leave the house. But work with whatever feels most comfortable and convenient for you. Remember, it is YOUR flow that is important, not someone else’s. I use the Ikea Raskog trolley, which most of you would be familiar with because it is everywhere! For the record, this is one of my favourite items in Ikea – it’s so practical and I have a billion and one uses for it! Here is one of them! First, my rationale for having a landing strip for my handbags is quite simple. I rotate my bags as often as I can, and I don’t always put one away, before I take out another. So, having a space for them is important, as I used to otherwise just put them on my dining chairs. The top rack of the trolley usually houses my bag du jour. Because I often trot out of the house with just a wallet sometimes, I ensure there’s space for me to put my wallet as well. I tend not to carry makeup in my bags, only lipsticks. So, I used to weigh down my bags with tons of lipsticks floating about in them. Now, I empty out my lipsticks when I get home, so I know just what is there. I can then pick out the ones I want the next day. The other racks of the trolley house the mail (bills, ugh! ), eco-bags, other bags I’ve switched out from and are airing out before storing, other totes that I might switch to on weekends and other miscellaneous items. I’ve taken to carrying a simple cotton tote when I’m out and about running errands. Do note that the Raskog trolley does not come with hooks. I had some hooks from a different shelf, that quite opportunely fit the Raskog. You could probably find something similar too. I find it useful for hanging things on, like my tote bags. 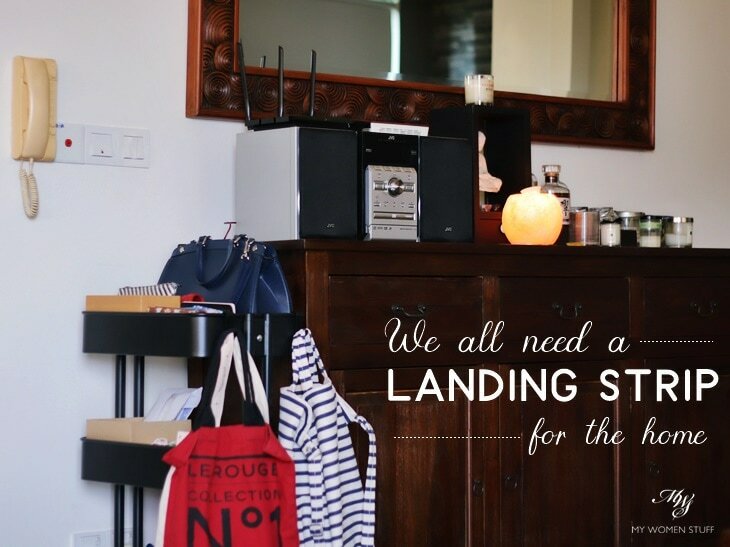 How has a “Landing Strip” helped me contain my clutter? In the 3 years since I started using a “landing strip”, I’ve found that my propensity to clutter my space, especially on and around my dining table, has been reduced. If not eliminated, at least, it’s restricted to just the area surrounding my landing strip. Instead of me walking into my home, and then dumping my things on any convenient horizontal surface e.g. sofa, dining table; I now place my keys in the tray, and my bags directly on the trolley. Initially, it took a bit of conscious thought, but now, I do it almost without thinking. What this does for me, is to allow for my other spaces like my dining table, as a prime example, to be clearer so I can actually use it without first sweeping a pile of stuff into a box and packing it away. Not only does a landing strip like this corral my things, it also corrals my clutter, so I only have one key area to deal with. It also helps me find my things more easily. Should I need my wallet at a moment’s notice, I know exactly where to find it. I don’t have to root through my bags, or run around the house wondering where I last put it. It’s right there on my Raskog trolley. Do you have a landing strip in your home? Will you be setting up one? Oh my goodness, turns out I have a landing strip and I didn’t even know it was a thing! I feel so on trend now lol! So number one – Little shelf by the door, where I put my keys in a bowl. Rack next to it – coat, hat, scarf. 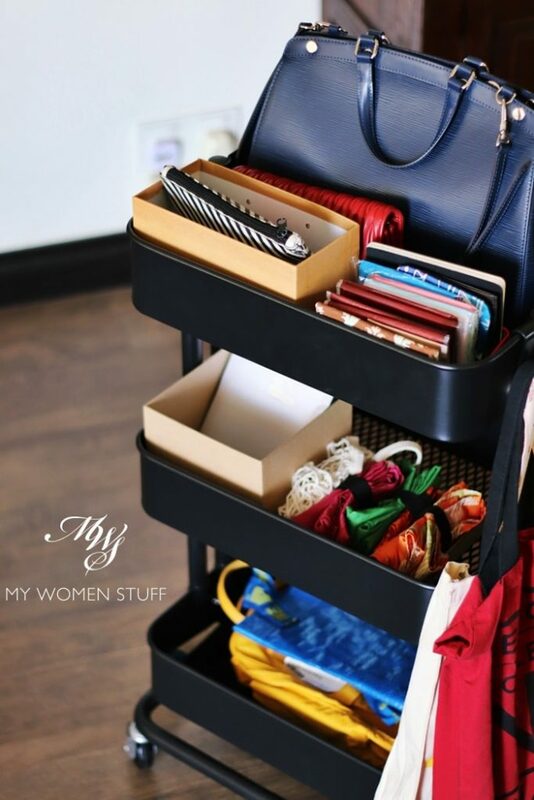 Shoe rack on the floor (I’m in the U.K., coats and boots are essential haha) then just around the corner in the kitchen, number two – I use a metal napkin holder for mail and I use the kitchen door handle for my bag and my cotton totes for shopping. Yay!! Oh and all of my storage racks, holders etc are from Ikea too!! So many many miles separate us all and yet we all have the same habits!! I never used to be like this AT ALL but I do try and stick with it. Now I never lose my keys, for one thing! Oh but I have the same problems with lipstick- the one I want is always at the bottom of a bag lol. And I change bags all the time, but I never swap everything over properly. Hey ho. But anyway – yes, landing strip – love it!! If it’s not a trend then we need to start one lol. And I’ll get right into the lipstick thing haha – always glad of an excuse to buy a cute little bowl! yeay for organization! and your dining table space! I have been eyeing this trolley for a long time! I will probably get it when the kid stops pushing anything with wheels around the house. We don’t really have a landing strip at home, but we do have hooks for car keys, and those eco bags. I usually fold the eco bags immediately back to into my bag as soon as I unload the stuff when I reach home. If I don’t do that right away, chances are, the eco bags will be left hanging on the chair for forever. I carry the same laptop bag every day so all my wallets are in the bag. I however, still leave the laptop bag on the dining chair, or on the floor if the chairs are all occupied. After all, home organization is a life-long business, right? LOL Now that it’s on sale, get it, but don’t assemble LOL! Actually we have one and the kiddo doesn’t push it around. He knows it houses his fave snacks though, so he’s often hovering around it LOL! OMG I know what you mean about folding up eco-bags once you unpack. Sometimes, I leave them to air a little, and then they hang on the chair for a week! 😛 I may be trying to be neat, but I often lapse every now and then to my slothful ways 😛 Isn’t it funny how our dining tables and chairs are like the catch-all places to leave things? I think it’s because it’s the biggest horizontal area around LOL! LOL! That used to be me Tine! Throw it all on the table (not counter) But perhaps, since that’s a convenient area, perhaps you can arrange it so everything is nicely corralled instead of looking messy 😀 And I bloody love the Raskog! I have something like 3 at home, holding various bits and bobs around LOL! It’s so handy, so well-made, and so cute! My desk and chair is my landing strip (>_<) I called it an organized mess. Hahaha.. I have that trolley too! But not as a landing strip, haha.. I use it to store all the backup bottles of body wash, shampoo, contact lens solution, etc etc. (I blame all those promotions on bulk purchase) And also all the body lotions. I need them to be out in the open instead of hiding in a drawer somewhere whereby I'll forget their existence until the next spring cleaning. So my trolley actually looks a bit like those in hair salon, full with bottles. I hook my recyclable shopping totes around it too. Ikea is having it on sale currently; Rm119 (NP RM149). Your post makes me want to get another one haha..
i love this solution! was just remarking to my husband that we (the whole family) love to dump everything everywhere the moment we walk into the house. will be trying this one out! thanks ? It’s a cool name: Landing strip! We do have one at home too! Keys and bills and miscellaneous on top of a chest drawer (IKEA) next to the door. Next to this landing strip is where we hook the hats/caps and bags. Not enough hooks, so we recently got another 4-tier rack from IKEA for more bags! School bags for the boys and my work bag and cooler bag and lunch bag and recycle bag etc… The hubs wanna faint when the bags overflow and got scattered on the floor next to the rack ? he will complain that we clutter his house, so once in a while I will need to gather some of the less used bags and chuck into the cupboard. Out of sight, out of mind . My landing strip is very important for another purpose : serves as a reminder for us to pack along when we go out. I will always remind the boys to place things that they want to bring out on the landing strip. So that we will not forget when we leave home,rather than blaming one another for not packing it. Sometimes the items will stop midtrack,be forgotten halfway through?